Later, we visited the Alexandria Loch Lomond Shores. There are numerous attractions for all ages, an aquarium, fun fair and playgrounds for children, shopping facilities, and restaurants and coffee shops where you can not just eat, but also relax and enjoy the beautiful scenery of Loch Lomond. There are numerous other activities on offer, such as kayaking, cannoning and paddleboating. On our way back to Edinburgh, we decided to visit the Falkirk Wheel. This is the world's first and only rotating boat lift. 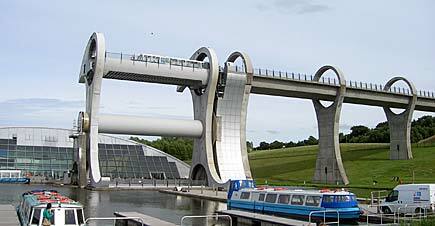 It was opened in 2002, linking the Forth & Clyde Canal with the Union Canal using the latest engineering masterwork. It has since become a very popular tourist attraction in Scotland. The wheel is 35 metres high and can lift loads of 600 tons in just 15 minutes. As a comparison, what now takes 15 minutes would take half a day in the past. Arriving back at the car, we saw three people taking pictures of the car. Ali spoke to them about the Friendship Arabia Tour and in turn learned more about them too - they were from Saudi Arabia, France and Scotland.